Two years after I killed Blyth I murdered my young brother Paul, for quite different and more fundamental reasons than I’d disposed of Blyth, and then a year later I did for my young cousin Esmeralda, more or less on a whim.That’s my score to date. Three. I haven’t killed anybody for years, and don’t intend to ever again.It was just a stage I was going through. Let me introduce Frank Cauldhame; sixteen years old and living a reclusive lifestyle in rural Scotland with his father.The typical adolescent though, Frank is not. If it is not obvious from the above quote, Frank is a sociopath; although he has limited his murder of humans to three, he continues to torture and murder animals, using them in rituals to help predict the course of events in his life. Told from Frank’s perspective, the story opens with news that Frank’s older brother Eric has escaped from a psychiatric holding facility. Oh yes blog follower, not one but two mentally deranged individuals in one family. With Eric arrival imminent, Frank’s story unfolds switching between current events and Frank’s memories including the abandonment of his mother, a savage attack on him by the family dog which maimed and physically altered Frank, and the three horrific acts of detached, calculated murder. Which leads me to that regular old disclaimer from me; if you are at all easily offended or squeamish and wish not to purposefully introduce dark, disturbing reading material into your life, then avoid this novel. I like to think I am providing at least some small kind of service to those who wish to avoid such books. Don’t all rush to thank me. This is a masterful novel, the first outing for Banks. This is the first of SIX of his books on the list and is a quick read, but by no means easy. The prose is straight forward but the subject matter is hard hitting. Frank’s internal monologue is far from a rambling mass of delusional diatribes. He is clear, methodical and applies his own brand of morality on everything he does. There is a genuine quality in Frank, a madness that is not in any part an affectation and it is this, the characterisation of someone abhorrent and yet deserving of our sympathies and in some way, affection, that Banks genius is clearly evident. For example, when Eric and Frank get a chance to talk Frank becomes horrified that Eric could possibly have a dog with him, setting dogs alight being one of the key indicators of Eric’s deepening instability. Yet, earlier that same day, Frank kills one rabbit with his bare hands and then blows up a warren, delighting in his victory. Frank is self-aware, he knows just what kind of monster he is and is often repentant, but is unwilling or unable to change. The story itself moves along at a great pace, never feeling sluggish. This is aided by its short length, but also in the way that the past and the present being are revealed at the same time. All leading to Eric arriving back at the family home, bringing revelations that changes Frank’s world and the readers perspective of it. I feel like I am doing a disservice to those who will avoid this book because of some content. It really is a great story, with one of the most interesting characters I have read in a long time. The elements of ick can be viewed as sensationalist or can be viewed as necessary to Frank, his inner dialogue, his idea of himself and therefore necessary to the story. I would like to therefore take back my advice and just add a little cautionary message because this book is worth reading and I feel like it is a great introduction to a wonderful author. Highly recommended. 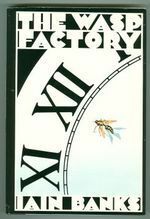 Despite the disturbing subject matter, I found The Wasp Factory to be very readable. It’s pretty dark but it didn’t give me nightmares.